Kwik Kerb is the premier supplier of concrete kerbing and landscape edging in the world today. The continual development of innovative products has allowed Kwik Kerb to maintain its status as the world leader in continuous concrete edging for over 25 years. The Kwik Kerb name is very well known and respected and is synonymous with quality concrete edging. · & many more uses! Garden Edging Kwik Kerb is great for keeping soil and water in your garden, weeds out of your lawn, giving your landscaped a great look and increasing the value of your property! 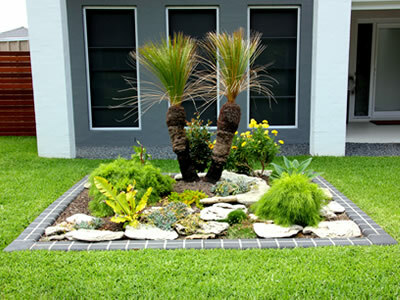 Have a strange shaped garden, or want to create a new garden bed in the middle of your lawn not a problem with Kwik Kerb. Choose your shape from six different profiles to suit the character of your home. Choose your colour, match your Kwik Kerb with your fence or gutters. Choose your style – from Brick, Slate, Wood or plain it is up to you. Kwik Kerb Business Owners offer you a satisfaction guarantee. If you choose a Kwik Certified Kerb Business Owner as the provider of your concrete landscape edging, you can be assured of a job you will be well satisfied with by a Certified Kwik Kerb Operator, doing everything possible to provide you with the best product available. All Kwik Kerb Business Owners are trained in the application of the product. They are thoroughly trained in the use of the equipment; however, much the training’s emphasis is also placed on the finishing of the work so that Kwik Kerb’s high standards are maintained. This attention to detail gives Kwik Kerb customers total confidence in the final appearance of the completed work. To provide the product with room to flex as the ambient temperature changes, control joints are installed. This allows the Kwik Kerb to crack in a controlled way when ground movement etc. stresses the kerb. A minimum of one part cement to four parts aggregate is used in the Kwik Kerb concrete mix. This provides a consistently high strength concrete kerb. Most Kwik Kerb is also over-laid with a special, very strong cement sand mixture which makes the surface of your concrete edging very resistant to scratching, chipping and weathering. (Most alternative kerbing companies don’t use this method and the result is a very short life span for their edging.) Kwik Kerb also has a special sealer applied to the surface of the concrete as it is installed. Kwik Kerb has hundreds of Business Owners around Australia and many more worldwide so chances are Kwik Kerb is available in your area! If you are looking for the ultimate in garden, driveway or landscape edging, contact Kwik Kerb today.